After moving into my fiancée’s apartment, the one thing she had missing that bothered me, was a nice tool set. She had three screwdrivers and a hammer. They weren’t even in any kind of a set. I put them in a plastic bag and gave them a spot in a closet just to keep them together! I had a fine selection of tools, which I had to ditch when I moved, and now I didn’t even have a pair of pliers for changing guitar strings! Given the compact nature of living in an apartment, I knew I needed an actual toolset, rather than a selection of tools shoved in a box or bag. A box or bag designed to store the tools I had, taking up a predetermined amount of volume was exactly what I needed. I had said something in passing while future mom-in-law was around, and on my birthday, I was gifted with this 22 piece set from Kobalt. I was incredibly excited and started taking the plastic off the tools as soon as I received it. My fiancée was both intrigued and amused! I think it’s important before I go any further to clarify: I’m a writer, not a tradesman like a builder or a plumber or an electrician. I definitely did not need any expensive, professional, heavy duty tools. I just needed something to undertake light work and DIY around the apartment. I expect 50% of this tool set’s use will be using the pliers to change around the home strings, with maybe 35% on DIY and light repairs, and the remaining 15% on mad projects undertaken for curiosity and the general lols. I’ll be honest, I had never heard of the Kobalt brand before. I place immense value of having a tool set handy, but I hadn’t got as far as brand research. I was as excited to evaluate what I’d received, as much as I was to receive it! Taking a good look at the soft case the tools came in, and I have to say, I was very impressed – surprised, even – with the quality. With something like this… I don’t know… I guess I was expecting something a little bit flimsier? If that’s the right word to describe something made of fabric? I guess I felt that with a smaller toolkit aimed at homes, there wouldn’t be as much attention placed on having a durable case. But no. That wasn’t so. This is incredibly strong and sturdy, and I can easily imagine it as being just as convenient on a construction site, or for a maintenance person in a building. The center of the case is a compartment for holding a plastic case for your nails and screws etc. You can amend the sizes of the compartments in the case as you need. The tools themselves came packed in plastic within the case. I thought that was excessive and pretty unnecessary. I don’t know why the couldn’t just secure the tools in their respective compartments within the case – surely it’s cheaper to do that? That’s a list that should keep any householder capable of undertaking basic household work and repairs. It’s got a clip at one end for the measuring tape. It’s a cool idea, but I’m not sure if it’s the most practical one. There aren’t any ratchets or anything, but that’s not something I’ve ever used. I’ve had this for a couple of weeks now, and I’ve certainly used bits from it a few times. To date, the large screwdriver seems to be getting the most use, but the box cutter, both pliers, and scissors have also had outings. So far so good. They all did exactly what I needed them to do – you can’t ask much more of something than that. 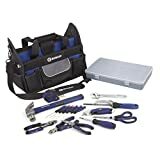 I would definitely recommend this tool set for anybody in a similar scenario to me e.g. need a tidy set to have on hand for any light jobs around the home. Having used a few bits of it at this stage, I certainly wouldn’t accuse Kobalt of presenting inferior quality products… for home use. They’re fine for my bits and pieces, but if they were being used all day every day, I don’t think they’re last a week, but that’s really not what they’re for.